Add a little eye-candy to your outgoing mail with these elegant return address labels. Sometimes the smallest details can make a big difference. That's what you'll find with Flower-Filled Corner Address Labels from CheckAdvantage! This tasteful selection features an attractive floral print in four different colors. They're the perfect way to give every letter and package you send a personal touch that shows off your sense of style! Plus, this convenient product also makes a routine task extra easy. Just peel and stick the labels on each envelope and you'll never have to scribble out your name and address again! 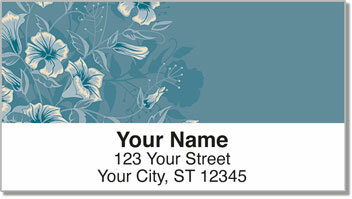 Get your own Flower-Filled Corner Address Labels now! This design is also available as a set of matching personal checks.